A strange idea has taken over the social conscience so entirely that it is a taboo even to say what it is. Children have come to be seen as more valuable than adults not despite but because they lack the psychological maturity that makes persons objectively valuable. 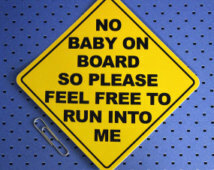 Consider the appearance of "baby on board" placards from the mid-1980s onwards. Something has gone very wrong in the way we think of the ageing process! Fortunately philosophy can help. Children are morally special in one particular - their extreme neediness. They have extensive often urgent needs that only suitably motivated adults can meet, and the younger they are, the greater their neediness. That makes children's care and protection a moral priority in any just society - there are lots of things that aren't as important and should rightly give way to meeting children's needs. As a result, children create multiple obligations upon their care-givers, as well second-order obligations on society in general, to ensure those needs are met. Yet the fact that you should give way to an ambulance attending an emergency doesn't mean that the person in the ambulance is more important than you; only that her needs right now are more important than you getting to work on time. Likewise, the immanence of children's neediness should often determine how we rank the priorities of actions we want to do, such as interrupting a movie to attend to a baby's cries. But such an action ranking is not a guide to the relative worth of children and adults, or of babies and teenagers. There will surely be times when something even more urgent occurs - such as someone having a heart-attack in front of you - that requires a baby's cries be neglected for the moment. As a psychological phenomenon it is not especially remarkable that the moral importance of attending to children's needs is routinely transformed into a general impression that children themselves are particularly important. But the mixing up of neediness with worth is only one source of our greater confusion. The other major source is rather more blameworthy: identifying psychological immaturity with moral worth. For a peculiarity of the moral priority we grant to the neediness of children is that we do not apply it to equally needy adults, most obviously those whose mental and physical faculties decline in old age in a somewhat symmetrical way to the development of those faculties in children. If we only cared about neediness we would care more about, and take on more personal responsibility for, meeting the needs of the disabled in general without regard for their age. Of course we don't do that. We seem to place a special value on children because of their blankness, the fact that they have not thought or done anything interesting or important yet and their identity - their relationship to themselves and to others - is still unformed. (Some abortion activists make a great deal of the innocence of foetuses, the ultimate non-achievers.) As children grow up and become more like people, with a life of their own – with friends and favourite things and secrets and dreams and ideas that are genuinely theirs - they seem to become less valuable. I can't explain this bizarre phenomenon. Maybe it has to do with religious concepts of sin and the idea of innocence as remaining untouched by the corruption of the world. Although, if the world is really so bad, parenthood seems a monstrous decision - the voluntary creation of new sentient creatures and thus of new suffering. Maybe we are particularly affected by the discrepancy between potential and actual achievements: a baby could grow up to be anything at all, but with every step it takes more of those brilliant possibilities fall away. But life is for living - what do possibilities matter if you don't take them up? A blank canvas is perfectly free of mistakes, but also perfectly free of art. Maybe we just have an evolved doodah in our brain that makes us think babies are irresistibly cute and really important, so that we wouldn't throw the annoying things out of the cave. But evolutionary histories aren't moral justifications. Maybe it is because the deaths of children seem especially significant events because they are so unusual these days, thanks to our mastery of communicable diseases. When the deaths of children receive so much more media attention than the deaths of adults we may just assume that their lives must count for more. Maybe all of those and more. In any case, explanation is not justification and the result is eminently absurd. We have it back to front. People's lives get more valuable as they 'grow up' because in growing up we gain more life to live. The greatest part of the value of a human life, as opposed to that of a merely sentient animal like a mouse, relates to the development of personhood. Persons are what children are supposed to grow up to become. Persons are able to relate to themselves in a forward and backward looking fashion, to tell a story about where they have come from and where they are going, to determine how they should live, to relate to other persons as independent equals, to explain and justify themselves, to make and keep promises, and so on. Personhood in this sense normally develops over the course of a life, peaking generally around the mid 50s, the traditional prime of life, before beginning to decline again. The trouble with our attitude to children is that the less like this idea of a person they are the more valuable children's lives are supposed to be. The younger and more inchoate their minds and the shallower their ability to relate to themselves, others, or the world, the more significant their lives are held to be and, for example, the greater the tragedy if one should die. Of course the death of a child is a tragedy for her parents. But the fact of their grief, and our readiness to sympathise with it, doesn't address the issue of relative significance. Is it really the case that the death of a baby is an objectively worse thing to happen in this world than the death of a toddler than the death of a teenager than the death of a middle-aged adult? The death of an adult person is a tragedy because a sophisticated unique consciousness has been lost; a life in progress, of memories and plans and ideals and relationships with other persons, has been broken off. The death of a young child is also a tragedy, but it seems a comparatively one-sided one: the loss of an tremendously important part of her parents' lives. What about fairness? Isn't it more unfair for a child to die than an adult, since the adult will have gotten to live so many more years? Not so. Unless one wants to accept the ultimate value of the life of the just fertilised egg. Death affects the child and the adult differently. The younger the child the less real her presence in the world, including to herself, and the more she resembles the generic outline or idea of a child. By contrast an adult has developed much further her life's project of constructing and refining a unique identity of her own and therefore she, and the world, has much more to lose by her death. I don't mean to suggest that the only way to value a life is in death. Think of it this way. An acorn has what Aristotle called a telos, its ‘life's ambition' is to grow up into a mighty oak tree. But it would be odd to claim that an acorn was therefore worth more than an already existing oak tree. Likewise, the telos of a child is to grow up into an adult, a full person. Childhood is an intermediate state that is meant to be overcome by something better. It would be odd to claim that the thing which is better is worth less. To do so suggests that we want to deny the child's telos - we don't want her to grow up. What follows from such an analysis? Not, I suggest, that we should care any less for children but that we should care more for adults. First, we should attend equally to the urgent needs of any living human being, including the need to be loved, no matter whether they are very young or very old. Second, we should do more to recognise the particular value of the lives of the middle-aged. On the principle that a good idea realised is better than a good idea merely, we should acknowledge that oak trees are more valuable than acorns. Adults live fuller, deeper, and more real lives than those who have yet to grow up. The baby on board placards don't play any role in my argument besides illustration. But here is an account of their history for those readers who are interested.